A recent addition to my camera bag is the Micro four-thirds Olympus OM-D EM1 Mark II camera and now the 300mm lens that go along with it. With the pair, it gives me a mind-boggling 600mm focal range as a 35mm equivalent. I am hoping that this will be a great walk-about kit for my bird photography and am only just starting to play with its possibilities. It’s taking me a bit of time to get accustomed to this new kit and I know that the more I photograph with it, the faster I’ll be with changing settings in fast situations. 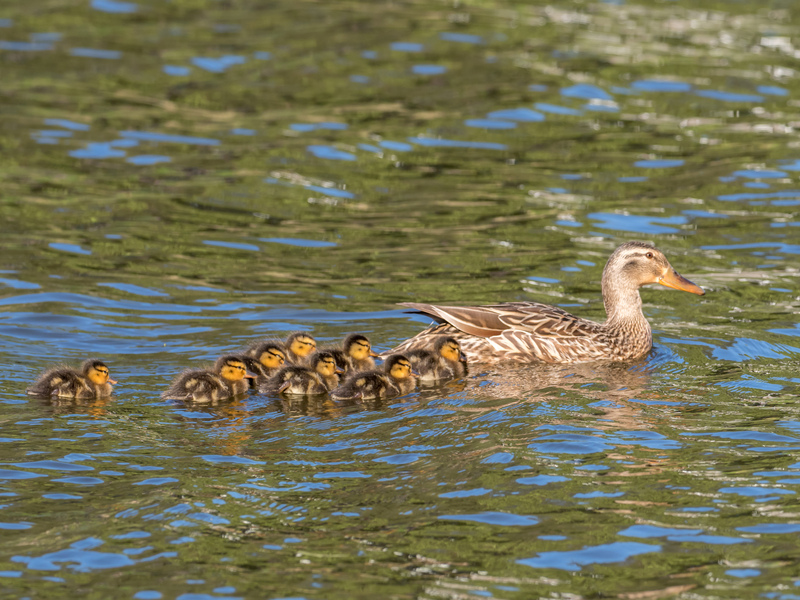 Such was the case today when I looked outside and saw Mama duck with nine little newborn ducklings. I had to grab the kit as fast as I could and quickly discovered that sometimes 600mm reach is too much. It certainly helped me last week when I was photographing some birds on the trail though. I am actually quite impressed by its ability for quick focus and the rapid 15 frames per second that are available with the mechanical shutter. My challenge is now to learn how to quickly change focus points and metering modes as these two features are something I frequently use when out in the field. Now back to the babies…Mama duck with her babies, and then a Canada goose couple showed up with eleven in tow. Somehow I think they kidnapped some of the babies from other geese as they were different in age. Can’t help to love the babies when they are around. These are fantastic Emily 🙂 Isn’t the mirrorless system wonderful! I’m slowly getting the hang of it Sarah. I don’t practice with it enough though. It will gradually take over Emily! I’m only taking mirrorless away with me to Greece this year 🙂 So much lighter and simpler! Beautiful photos, Emily. I, also, use the Olympus four-thirds system and have the 300 mm lens. I recently switched my camera to back-button focus, so focusing and pressing the shutter are separate actions. I chose the Fn2 button as most comfortable for me. I followed the steps in this article http://robknightphotography.com/back-button-focus-on-the-olympus-om-d-e-m5/ . Should work the same on your EM1 Mark 2. Wonderful Susan ! Thank you for sharing! 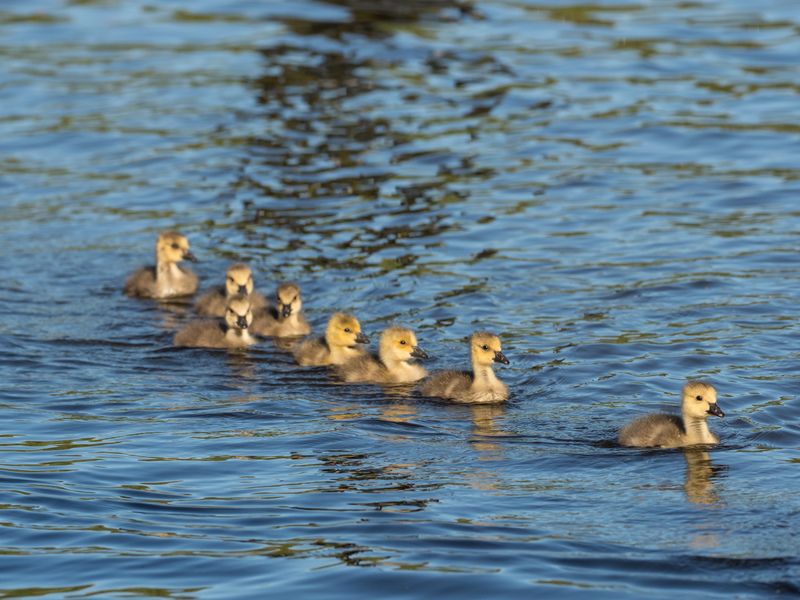 I photographed 11 ducklings at Buddy Attick Lake today (05/15) with my Olympus 300mm. I heard there are 11 of them (wood ducklings that is. How exciting is this ? Also, if you were out today than that means you felt good. YEAH !! I am such a fan! I can’t wait to see your pictures every time I login. I’m such a nature lover and birds are my favorite. Thank you for brightening my days. I’m not a photographer, but I can still appreciate good work. I have the first EM-1 and I found it useless for shooting birds in flight. From what I have heard the Mark 2 refreshes faster but nowhere as good as DLSR. At $2,000 I’m not up for a gamble. For still shots like you seem to be taking the camera is fine. Very nice bird photos. I also have the EM1 Mark II which I really like. I recently purchased 12-100 f4 as a general purpose lens for travel. Seems to a really nice addition to my kit.